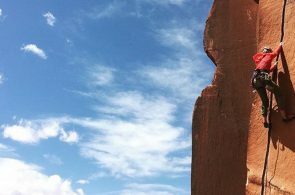 “Can I still climb?” – Beth Rodden answers the first question many female climbers pose when expecting. When Randy and I first found out I was pregnant, we had a host of emotions: ecstasy, excitement and terror, as any first-time parents would have. As an athlete I was also afraid of what pregnancy would mean for my body. Most of my time and energy during my adult life had gone into training for peak fitness for climbing. As I settled into my new pregnant body, I learned to love having more purpose for it than just use and abuse in sport. I started to think of how to nourish my body instead of just how to use it, but I still wanted to climb. I started blogging about climbing while pregnant mainly because I could find so little information on the topic. 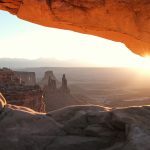 Within a day of publishing the blog I had heard from dozens of women around the world, including two doctors, all of whom had climbed or were climbing while pregnant. 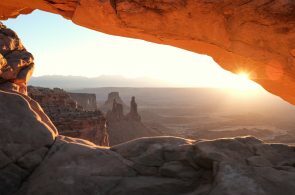 The doctors not only offered tangible medical advice, but also came up with the idea to conduct a survey, asking women a variety of pregnancy-related and climbing-specific questions. A total of 339 women responded and helped produce some really interesting and helpful results (see below) that I published on my blog in March 2016. 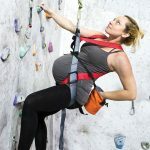 Based on these results, my own experience and the experience of others, I believe that climbing can fit into both a healthy pregnancy and parenthood. I stopped bouldering at around 10 weeks as I didn’t like falling. I stopped leading at around 12 weeks, and prior to this I only climbed easy routes and never felt I risked falling. Joints loosen during pregnancy to prepare for childbirth, so I avoided hard and tweaky climbing that stressed my joints. I also stopped doing abdominal exercises because of diastasis (the splitting of the abdominal muscles), which commonly occurs during pregnancy. I climbed easy routes but stopped completely at six months as my body started to feel swollen and loose. I did not “train” during pregnancy. I only performed Theraband shoulder exercises and took daily dog walks. At five months, when I felt ready, I started doing specific post-baby recovery exercises to help with my prolapse and diastasis and to regain core strength. My joints remained loose until a year postpartum, so I avoided overhangs, cracks and pockets that overly stressed my shoulders and fingers. I started hangboarding a year postpartum, once my joints felt tighter and my body felt ready. I started very slowly and built up over the next year. 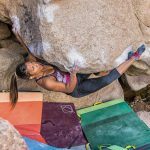 Bouldering is an acommodating type of climbing for families: you are close to the ground if the kids need anything, you aren’t tethered to a rope, and it can be done in a group. Find other families to climb with. That way the kids can play together, and the adults can help each other out. Bring helmets for the kids. 20 weeks when most started limiting their climbing. 31 weeks when most stopped climbing. 6% sustained injuries while climbing. 74% observed a change in strength. 59% experienced a change in their joints. 73% experienced a change in their balance. 3.5 months average time to return to climbing postpartum. 96% breastfed and 7% saw a change in milk volume when they returned to climbing. Beth Rodden has climbed for 20 years and established many routes, including the unrepeated Meltdown (5.14 R) in Yosemite. 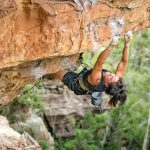 Kathryn Sall looks at new ways to approach fear and bravery in her climbing, and contemplates the different ways that young boys and girls are socialized with regards to these emotions. 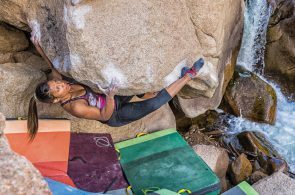 Angie Payne, three-time national bouldering champion and first woman to climb a V13, on the pursuit of power for rock climbing.